Continuing from the previous article where I talked a little about Kinnaur valley in Himachal and how you can plan a trip here; in this post I will provide a sample Kinnaur Valley itinerary that you can follow for your trip. I will first provide an itinerary that I recommend; followed by a few alternate versions of it. For the sake of this article, I will assume that you are starting your journey from Delhi. If you were however coming from a different city, then only the journey for first and last day will be different. Rest of the details will still apply. The way I am planning this trip is keeping in mind that you cover the most and visit all the places that are worth visiting without traveling too much on any given day. Not everyone will be of course able to follow this itinerary to the last detail. Your final travel plan will depend on several factors like how you are traveling; where are you traveling from; how many days do you have in hand and if there is a budget constraint. But the information below should at least get you started on drafting your own personalized itinerary. If after reading the article you have any other questions; or need my inputs for your itinerary; then please feel free to comment and ask towards the bottom of this page. Kinnaur Valley can be divided in two parts. First is the lower Kinnaur including areas like Sangla, Chitkul, Reckong Peo and Kalpa. Upper Kinnaur is the area around Nako village. Kinnaur district ends at Nako and the road further travels into Spiti valley. With that being said, the villages of Khab and Nako are mostly considered to be a part of Spiti trip; and people traveling to only Kinnaur usually keep their travel limited to Shimla, Narkanda, Sangla Valley and Kalpa. Also Read: How to Make a Budget Trip to Kinnaur Valley in Under 10k? If you asked me, then I will also recommend doing the same. There are two reasons behind this. First is that until Rampur, the roads are mostly good with a few bad stretches in between. But once you cross Pooh, then the stretch until Khab is a badly broken road. I have been in this area a few times and have always found this road to be under repair. Second reason could be my own personal opinion but to me, it is also the least scenic area in all of Himachal. Greenery will be all gone and it is mostly just a broken road, with repair work going on, dust in the air, black hills on both sides and Sutlej flowing in between. There isn’t a single thing that you will call scenic here. If is only after you cross Khab Bridge and climb up to Nako that the vistas improve a bit. A third reason could be that going from Kalpa to Nako and coming back will take at least 2 more days. And considering that the road will be broken and route not that scenic, I wouldn’t call it worth spending 2 days here. A better way would be to spend this time towards greener Kinnaur and leave Khab and Nako for another trip when you can travel on the entire Spiti circuit. From Nako, Manali is only 2 days journey so if you have gone all that way, you might as well cover Spiti valley too and exit via Manali. The first itinerary I am suggesting below will exclude upper Kinnaur and will be limited to lower areas only. If you however would like to include all of it in your trip then I will suggest an alternate version as well. 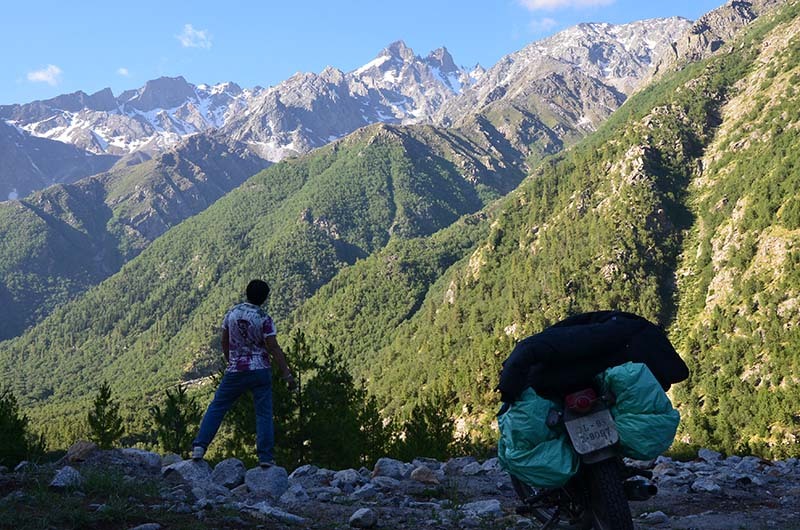 Starting from Delhi, your trip to Kinnaur valley can be as mentioned below. Even if you were coming from a different city, then only the part about traveling from and to Delhi will be different. The journey between Narkanda and Chail will still apply. This is a total of about 9 to 10 hours depending upon your breaks covering slightly over 400 kilometers. I have always found staying at Narkanda better than staying at crowded Shimla. Road conditions for most part of the journey will be good. The total distance from Narkanda is about 185 kilometers and can take you well over 7 hours to complete so please start accordingly. Drive until Karcham and then take the diversion towards Sangla Valley. From Karcham, Chitkul is about 40 kilometers and the road ends here. You may visit Kamru fort and Nages temple at Sangla on your way. Not too long of travel today; just about 65 kilometers easily doable in 2-3 hours. Drive back to Karcham from Chitkul and then take the road towards Reckong Peo which further leads to Kalpa. There are many hotels here where you can stay. The view of Kinner Kailash peaks from Kalpa is astounding and will blow your minds away. Like Chitkul, spend a day in Kalpa as well enjoying the natural beauty and tranquility of the place. Nearby tourist attractions here include the suicide point and the villages of Roghi and Kothi. If you are short on time then you may skip this day. You will drive back on the same road that you took to get to Kalpa. Reach until Jeori and then drive towards Sarahan from there. The Bhimakali temple and bird sanctuary at Sarahan is definitely worth a visit. It is a drive of about 90 kilometers and can easily be done in about 3 hours. From Sarahan, drive back to Shimla and then to Chail via Kufri. Total distance traveled will be about 180 kilometers and doable in 6 to 7 hours. Enjoy the sunset from Kali ka Tibba at Chail, this is a view not to be missed. Not much to write about this day except for that this will be a long journey back home. A total of about 340 kilometers that can be done in 7 hours. An alternate way to do this journey can be as mentioned below. If you were keen on traveling to Nako as well then you can either add a couple of days more to the itinerary above; or save days by not staying at Chitkul and Kalpa and extend the trip further till Nako. If however you went all the way till Nako I will advise continuing further and exit via Manali while covering Spiti valley as well on the way. This way, you will not be traveling on the same route for return journey as well and can explore more. The itinerary then will be as mentioned below. Also Read: How much Will a Kinnaur Valley Trip Cost? As you approach Kinnaur Valley, Petrol pumps and mechanics will be a regular affair. You will keep coming across gas stations at regular intervals. Places like Shimla, Narkanda, Rampur have authorized service stations of several car and motorcycle companies. In Kinnaur Valley, the last petrol pump is at Powari and Reckong Peo. If your plan was to visit upper Kinnaur as well then I would recommend you to tank up here. There is a petrol pump in Sangla but none at Chitkul. In terms of mechanics, or small fixes, you can get it done at Sangla, Reckong Peo or Kalpa but for any major repairs, you will have to bring your car back to Shimla. 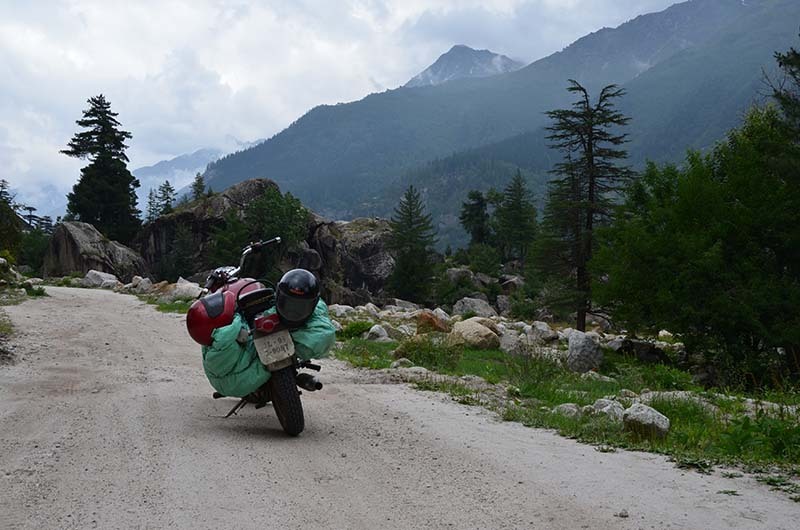 Road conditions in Kinnaur valley continue to change each year. There are some parts that always remain in good condition, some are always bad and at some stretches, there is restoration work happening all the time. Depending on your time of travel, this is how the road conditions will be in Kinnaur. Delhi to Chandigarh: A smooth drive all the way on NH1. Chandigarh to Shimla: Mostly OK but there is road widening work going on at some stretches which may result in slow traffic. Shimla to Narkanda: Good tarred road. Rampur to Karcham: A mix of good and average.